Warren Tales now has business cards! Printed on luxe white (textured) card stock (210g weight, I believe), with rounded corners. 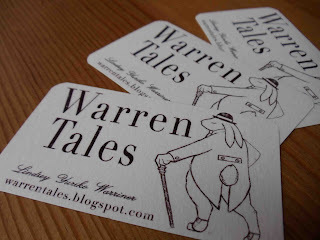 I'm looking toward getting a stamp made some time in the upcoming future, mainly for use as a tag on the back of Warren Tales products themselves, but for the purposes of business cards, I could not be happier with how these turned out, and I'm so glad to have made them myself! Seems fitting, after all. 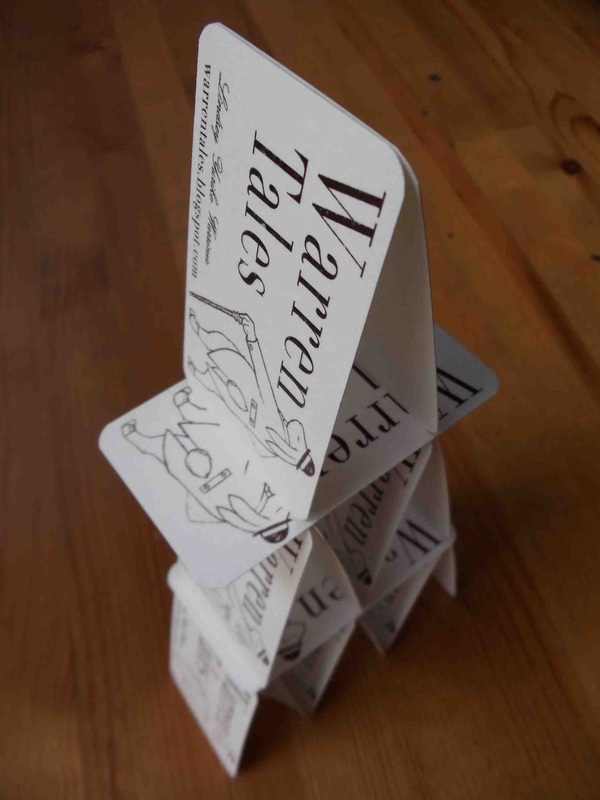 Warren Tales postcards are also available! Warren Tales is an independent paper craft studio and functions as a digital press, complemented by hand-typed and handmade products. 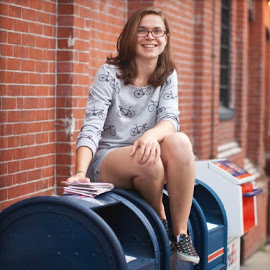 Our unique cards are created, cut, packaged, and plucked by unique humans to ensure the finest quality and letter-writing experience. Thank you Auburn, Birmingham, Huntsville, Montgomery, Shannon, and Tuscumbla, Alabama. Thank you Avondale, Flagstaff, Mesa, Peoria, Phoenix, and Tucson, Arizona. Thank you El Dorado, Arkansas. Thank you Alameda, Albany, Aliso Viejo, Antioch, Belmont, Berkeley, Beverly Hills, Buelton, Camarillo, Carlsbad, Chula Vista, Claremont, Clovis, Concord, Coronado, Davis, Downey, El Cajon, Encinitas, Fullerton, Gardena, Glendale, Goleta, Huntington Park, Irvine, La Jolla, La Mesa, Lompoc, Long Beach, Los Angeles, Manhattan Beach, Menlo Park, Mira Loma, Modesto, Murrieta, Newbury Park, Newport Beach, Oakland, Oceanside, Ontario, Palo Alto, Pasadena, Poway, Pittsburg, Rancho Cordova, Redding, Redondo Beach, Rohnert Park, Rosemead, Roseville, Sacramento, San Bernardino, San Clemente, San Diego, San Fransisco, San Gabriel, San Jose, San Marcos, San Mateo, San Ysidro, Santa Ana, Santa Barbara, Santa Clara, Santa Cruz, Santa Monica, Santa Rosa, Sherman Oaks, Solana Beach, South San Fransisco, San Ysidro, Stockton, Sunnyvale, Sunset Beach, Thousand Oaks, Tustin, West Hollywood, and Windsor, California. Thank you Denver, Grand Junction, Littleton, and Pueblo, Colorado. Thank you Bridgeport, Cromwell, Hartford, New Canaan, New Haven, Plainville, Waterford, and West Hartford, Connecticut. Thank you Avon Park, Boynton Beach, Ft. Lauderdale, Ft. Myers, Ft. Walton Beach, Gainesille, Hallandale, Hialeah, Jacksonville, Lakeland, Miami, New Port Richey, Orlando, Riverview, Seminole, Stuart, Tampa, Windermere, and Winter Park, Florida. Thank you Alpharetta, Americus, Atlanta, Blue Ridge, Cartersville, Ft Stewart, Jonesboro, Marietta, North Metro, Savannah, and Smyrna, Georgia. Thank you Boise, Driggs, and Rexburg, Idaho. Thank you Aurora, Buffalo Grove, Champaign, Chicago, Elmhurst, Evanston, Granite City, Manhattan, and Waukegan, Illinois. Thank you Bloomington, Indianapolis, Noblesville, South Bend, and West Lafayette, Indiana. Thank you Carroll, and Des Moines, Iowa. Thank you Lawrence, Manhattan, and Wichita, Kansas. Thank you Ft. Thomas, Kentucky. Thank you Metairie, and Shreveport, Louisiana. Thank you Biddeford, Bridgton, Kennebunk, Mechanic Falls, Saco, Sanford, and York, Maine. Thank you Baltimore, Beltsville, Derwood, Kensington, Laurel, Silver Spring, Stevensville, and Sykesville, Maryland. Thank you Allston, Arlington, Beverly, Boston, Boxford, Brighton, Brookline, Cambridge, Charlestown, Concord, Everett, Framingham, Hingham, Jamaica Plain, Lakeville, Marblehead, Marlborough, Natick, Newton, Norwood, Plymouth, Quincy, Reading, Rockland, Sandwich, Salem, Shrewsbury, Somerville, Sudbury, Watertown, and Westborough, Massachusetts. Thank you Ann Arbor, Caledonia, Commerce Township, Ecorse, Franklin, Grand Rapids, Lansing, Mount Clemens, Muskegon, Owosso, Port Huron, and Troy, Michigan. Thank you Burnsville, Circle Pines, Inver Grove Heights, Minneapolis, and Osseo, Minnesota. Thank you Cleveland, and Meridian, Mississippi. Thank you Columbia, Joplin, Kansas City, and St. Louis, Missouri. Thank you Missoula, and Ronan, Montana. Thank you Lincoln, and Omaha, Nebraska. Thank you Fallon, Henderson, and Las Vegas, Nevada. Thank you Concord, Dublin, Nashua, and Newmarket, New Hampshire. Thank you Bloomfield, Denville, Dover, Englishtown, Flemington, Jackson, Jersey City, Metuchen, Montclair, Newark, Princeton Junction, Raritan, Ridgewood, Secaucus, Sparta, Trenton, and West Orange, New Jersey. Thank you Albuquerque, New Mexico. Thank you Bayside, Beacon, Brooklyn, Buffalo, Ithaca, New Rochelle, New York, Plattsburgh, Poughkeepsie, Queens Village, Rochester, Selden, Syracuse, Tallman, Williamsburg, and Woodhaven, New York. Thank you Asheville, Burlington, Chapel Hill, Durham, Fayetteville, Greenville, Jacksonville, Matthews, Raleigh, and Swansboro, North Carolina. Thank you Beachwood, Cincinnati, Columbus, Diamond, Fairborn, Lakewood, Medina, Miamiville, Wooster, and Youngstown, Ohio. Thank you Blanchard, Mustang, Oklahoma City, Ponca City, and Tusla, Oklahoma. Thank you Beaverton, Coos Bay, Corvallis, Eugene, and Portland, Oregon. Thank you Ambridge, Butler, Coraopolis, Erie, Hazleton, Honesdale, Lock Haven, Philadelphia, and Scranton, Pennsylvania. Thank you Kingston, North Providence, Middletown, Pawtucket, Providence, and Tiverton, Rhode Island. Thank you Beaufort, and Conway, South Carolina. Thank you Athens, Cordova, Knoxville, Memphis, Murfreesboro, Nashville, and Smyrna, Tennessee. Thank you Allen, Arlington, Austin, Ballinger, Carrollton, College Station, Dallas, Flower Mound, Frisco, Garland, Houston, Humble, Lake Jackson, League City, Rockwall, San Antonio, and Sherman, Texas. Thank you Lehi, Salt Lake City, and South Jordan, Utah. Thank you Bennington, and Montpelier, Vermont. Thank you Arlington, Ashburn, Chester, Dumfries, Dunn Loring, Fredericksburg, Manakin Sabot, Manassas, Merrifield, Springfield, Reston, and Richmond, Virginia. Thank you Bellingham, Federal Way, Leavenworth, Longview, Seattle, and Vancouver, Washington. Thank you Martinsburg, West Virginia. Thank you Beaver Dam, Eau Claire, Fairwater, Grafton, Green Bay, Madison, Milwaukee Neenah, Onalaska, Phelps, and Sturgeon Bay, Wisconsin. Thank you Brisbane, Canberra, Cranbourne, Gold Coast, Melbourne, Sydney, and Wollongong, Australia. Thank you Leoben, and Vienna, Austria. Thank you Belem, Brasilla, Campina Grande, Campinas, Curitiba, Joinville, Limeira, Londrina, Maceio, Maranhao, Mogi das Cruzes, Nova Friburgo, Rio de Janeiro, Sao Luis, and Sao Paulo, Brazil. Thank you Burgas, Plovdiv, Pomorie, and Sofia, Bulgaria. Thank you Burlington, Edmonton, Greater Sudbury, Halifax, Laval, London, Malton, Mascouche, Montreal, New Westminster, Ottawa, Prince George, Red Deer, St. John's, St-Bruno-de-Montarville, Sudbury, Surrey, Toronto, Truro, and Vancouver, Canada. Thank you Phnum Penh, Cambodia. Thank you Bogota, and Caldas, Colombia. Thank you Liberia, Costa Rica. Thank you Abidjan, Côte d'Ivoire. Thank you Lamaka, and Limassol, Cyprus. Thank you Prague, Czech Republic. Thank you Hillerod, and Holte, Denmark. Thank you Guayas, and Pichincha, Ecuador. Thank you San Salvador, El Salvador. Thank you Beeston, Bournemouth, Bracknell, Brentford, Bristol, Bury Saint Edmonds, Cambridge, Daventry, Durham, Egham, Harpenden, Kensington, Lambeth, Leatherhead, Leicester, Liverpool, London, Luton, Manchester, Milton Keynes, Northampton, Nottingham, Oxford, Plymouth, Preston, Sheffield, Shepton Mallet, Slough, Solihull, Torquay, Trowbridge, Wembley, Witney, Wolverhampton, and Worcester, England. Thank you Arras, Hambach, Ile-de-France, Paris, and Rouen, France. Thank you Aachen, Baden-Wurttemberg, Berlin, Dresden, Erfurt, Frankfurt am Main, Hamburg, Hannover, Hildesheim, Mannheim, and Regensburg, Germany. Thank you Attiki, Athens, Kerkira, and Patrai Greece. Thank you Hong Kong, Hong Kong. Thank you Ahmedabad, Bangalore, Belgaum, Chandigarh, Cochin, Hyderabad, Kandivli, Lucknow, Ludhiana, Mahape, Mathura, Mumbai, New Delhi, Noida, Pune, Surat, Udaipur, and Vellore, India. Thank you Bandung, Denpasar, Jakarta, Sumatera Utara, and Surabaya, Indonesia. Thank you As Sulaymaniyah, Iraq. Thank you Dublin, and Letterkenny, Ireland. Thank you Netanya, and Tel Aviv, Israel. Thank you Milan, Naples, Rimini, Rome, and Venice, Italy. Thank you Hamamatsu, Naha, Okinawa, and Shibuya, Japan. Thank you Alor Setar, George Town, Kuala Lumpur, Perak, Puchong, Seri Kembangan, and Shah Alam, Malaysia. Thank you Ensenada, Mexico City, and Torreon, Mexico. Thank you Amersterdam, Hilversum, Maastricht, Noord-Holland, and Rotterdam, Netherlands. Thank you Auckland, and Wellington, New Zealand. Thank you Belfast, Northern Ireland. Thank you Panama City, Panama. Thank you Baguio, Cebu, City of Dumaguete, Makati, Mandaluyong, Manila, Misamis Oriental, and Quezon City, Philippines. Thank you Bayamon, Puerto Rico. Thank you Buzau, and Cluj-Napoca, Romania. Thank you Moscow, Rostov Oblast, and St. Petersburg, Russia. Thank you Jiddah, and Riyadh, Saudi Arabia. Thank you Aberdeen, Ayr, Edinburgh, and Glasgow, Scotland. Thank you Banska Bystrica, Slovakia. Thank you Cape Town, Johannesburg, Port Elizabeth, and Sandton, South Africa. Thank you Seoul, Suwon, and Yongin, South Korea. Thank you Albacete, Aviles, Barcelona, Cadiz, Las Palmas de Gran Canaria, Madrid, Salamanca, Tarragona, Toledo, and Valencia, Spain. Thank you Chu-Nan, and Hua-Lein, Taiwan. Thank you Port of Spain, Trinidad and Tobago. Thank you Bangkok, Chiang Mai, and Phitsanulok, Thailand. Thank you Ankara, and Istanbul, Turkey. Thank you Abu Dhabi, and Dubayy, United Arab Emirates. Thank you Thanh Pho Ho Chi Minh, Vietnam. © 2014 Warren Tales. Watermark theme. Powered by Blogger.